After a first article about 5th Freedom Flights in and out of Europe, let’s look at short haul flights inside Europe with widebody airplanes in 2018. Flying on large planes comes with quite a few advantages, and we will look into these as well as a complete list with types, time tables and a map. There has been multiple contributions to the 5th freedom flights article in the comments, which were all appreciated. With your contribution we can make this new list as exhaustive and up to date as possible as well! NEWS : Iberia will start flying its A350 on the MAD-LHR route on 20th July, only until end of August. Most seats seem to be still available (as of 30 march). A large portion offlying Europe is done on short haul, single aisle planes. Most airlines fly planes from the A320 and B737 family, the newer C-Series and Superjets, as well as smaller regional jet and propeller planes. Getting a widebody on these sub-3 hour sectors is always a welcome change. Benefits include wider seats and greater pitch, inflight entertainment systems, and just, well… the feeling! Unfortunately, these flights are few aand sometimes far between, and often subject to type changes and seasonality, such as the Air France 777 flights to southern France, or the Swiss 777-300ER on the Geneva-Zurich morning route. 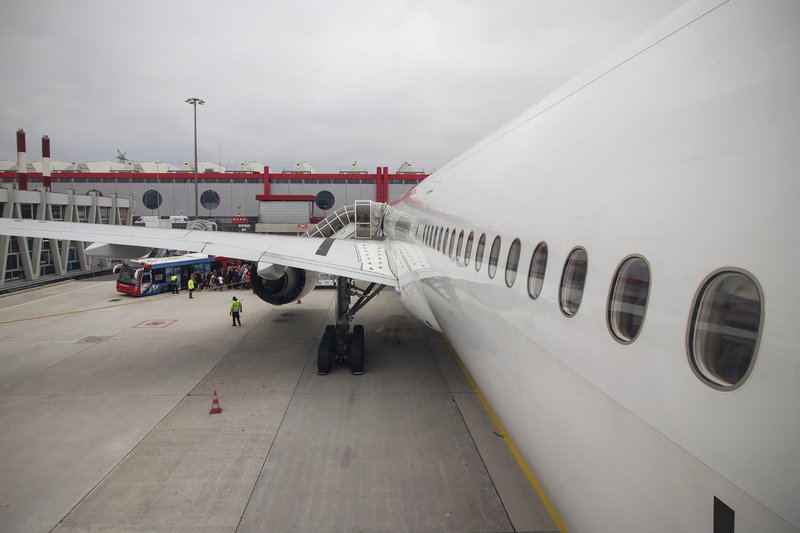 It is always good to be on the lookout, as airlines recieving new types in their fleets almost always fly either domestic or intra-european flights to familiarize the crews with the new equipment. I’ve had the chance to get on an Air France A380 from Paris to London back in 2010 with my friend Keishi, who also happened to be on the first 787-9 Air France sightseeing flight around France last year. At the time of writing (march 2018), we can look forward to Iberia’s A350-900s, coming in june of this year. Air France, Scandinavian, will be getting their A350-900s next year. British Airways and Virgin Atlantic ordered the longer A350-1000s, which will be coming next year as well. KLM will only be getting their A350-900s in 2020. The largest widebody operator on european flights is British Airways and their 7-strong fleet of 767-300s. 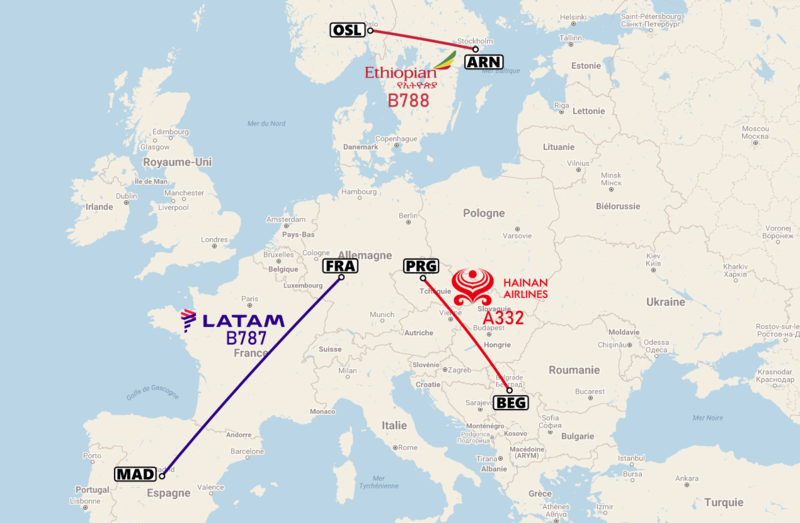 For easier readability, here’s a separate map of the BA flights. 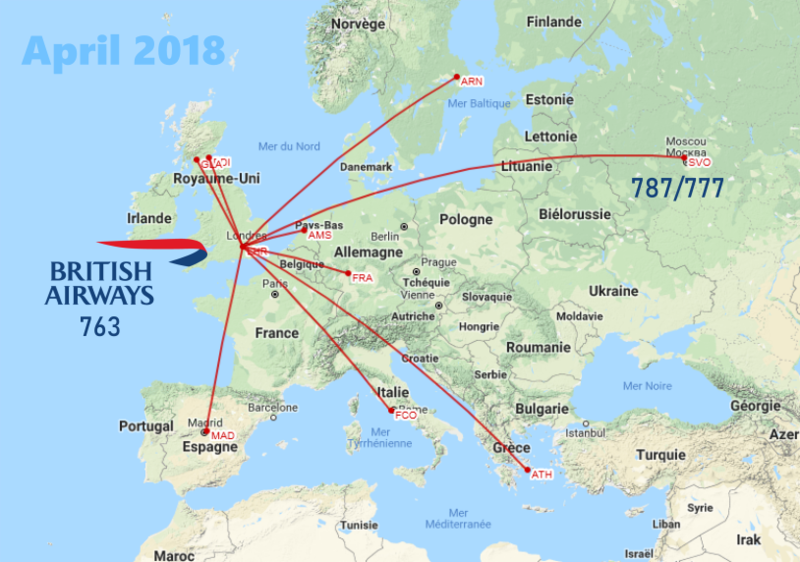 Widebody flights operated by British airways (updated april 2018)The Moscow flights are mostly flown during spring and summer, using a 787 from 2 april to 27 october, and a 777 after that. The Heathrow – Madrid flights have a codeshare with Iberia, who fly A333/343/346s on the route. Here’s a map of the other flights that I could find so far. Note that not all the flights are currently flown, so please refer to the table below to see the frequency and start/finish dates. 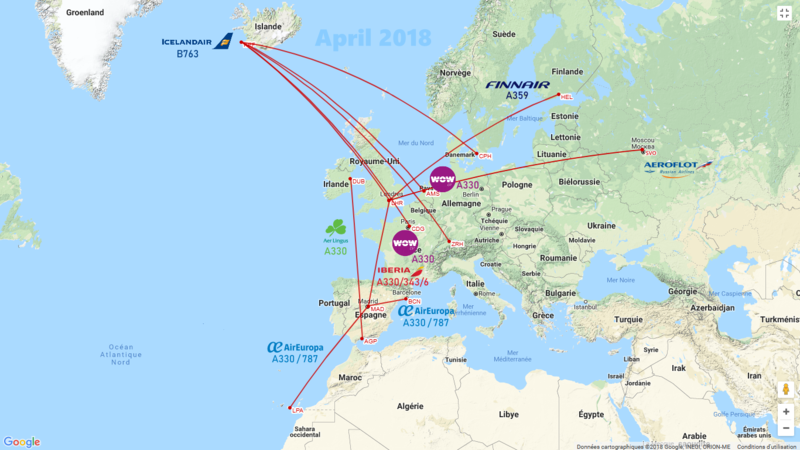 Widebody flights in europe in 2018 (updated april 2018)For the flights out of Reykjavik on the 767, all of them are flow by Icelandair except the Paris one which is Wow. The following table aims at giving more details about each flight. The departure city is meant as the starting point of the return flight (which matters for, say, Finnair LHR-HEL flights). Just recently Air Europe were offering 787 flights from Madrid to Rome, but have seen they no longer offer this option. Does anyone know if they will offer wide bodied flight to Italy in the near future. Missing here are TK FCO-IST flights on A330s on certain days of the week. TK also flies the A330’s IST-ARN on a regular basis. Finnair flies twice a week Brussels – Helsinki with A330. Hainan flies a 787 between DUB & EDI a couple days a week. I have been flying from Heathrow to Athens on a wide bodied plane 767 British Airways. Now they have stopped the 767 are there alternatives to flying in a wide bodied plane from Heathrow to Athens?